Keith's note: This note was sent out earlier today by Colleen Hartman, Director, Sciences and Exploration Directorate NASA Goddard Space Flight Center: \"All, I am so very sad and bereft to tell you that Piers passed away this morning. He was not in pain and his family was with him. A light has left our world. We will miss him so very much. He asked that Tucker and I arrange a celebration of his life here in Washington DC. in the Spring time. Piers knew your work was the most important in the world. Please continue fighting the good fight and remembering the great times we had with the most amazing man in this world. We will never forget him. With deep sadness, Colleen\"\n\nNASA Administrator Remembers NASA Scientist, Astronaut Piers Sellers\n\n\"In a New York Times opinion piece in 2016, he said, 'As an astronaut, I spacewalked 220 miles above the Earth. Floating alongside the International Space Station, I watched hurricanes cartwheel across oceans, the Amazon snake its way to the sea through a brilliant green carpet of forest, and gigantic nighttime thunderstorms flash and flare for hundreds of miles along the Equator. From this God's-eye-view, I saw how fragile and infinitely precious the Earth is. I'm hopeful for its future.' \"Today we lost a tremendous public servant who was dedicated to NASA, the nation and the world. He was a strident defender and eloquent spokesperson for our home planet, Earth. 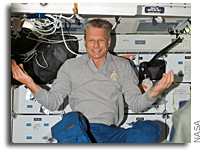 Spacewalker and scientist, free thinker and friend to our planet, and all who seek new knowledge, to say he will be missed would be a gross understatement.\"\n\nPiers Sellers: A Legacy of Science, NASA\n\n\"Piers Sellers, who passed away on Dec. 23 more than a year after learning he had pancreatic cancer, leaves behind a dynamic legacy at NASA. As an astronaut he helped build the International Space Station. As a manager he helped lead hundreds of scientists. And as a public figure he was an inspiration to many for his optimistic take on humanity's ability to confront Earth's changing climate. But his most lasting contributions will be in the field where he began his career: science.\"
This page contains a single entry by Keith Cowing published on December 23, 2016 4:06 PM. Is This The New Way To Do Aerospace Procurement? was the previous entry in this blog. Harriett Jenkins is the next entry in this blog.